On Wednesday I finally screwed up my courage and tried a brisket for the first time. Thanks, Adrienne, for helping me get this cut. I had it stored in the deep freeze and it took a couple days to thaw. 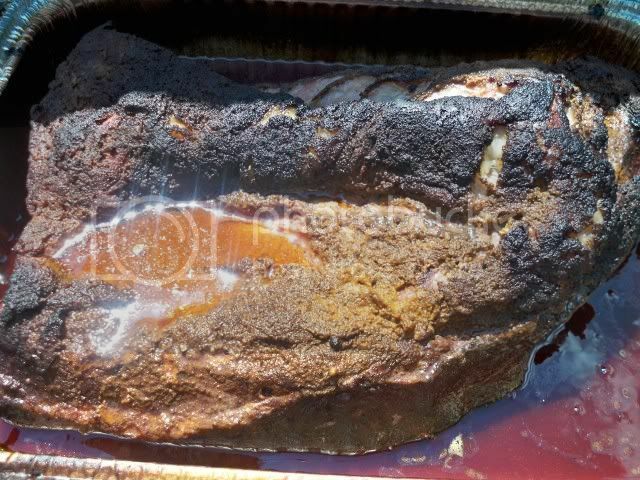 Once fully thawed it got a bath of worcestershire and a good healthy coating of rub. The rub contained onion powder, kosher salt, granulated garlic, Spanish paprika, brown sugar, black & green ground peppercorns, ground cumin and chili powder. I won't bother giving proportions unless someone wants them. It was a good rub, imo. 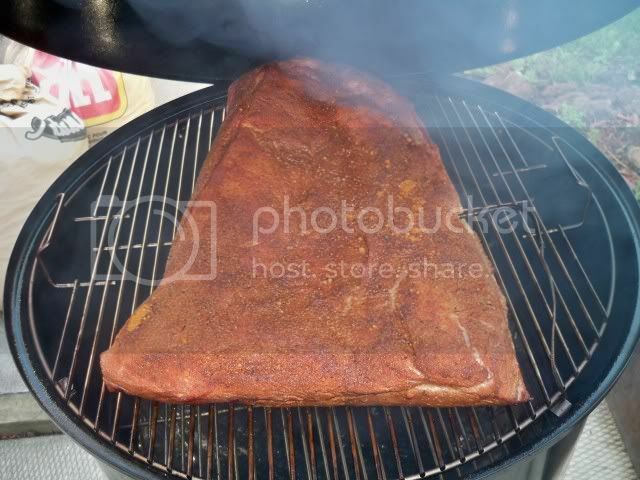 When it hit ~165 I put it into a foil pan and added a premix of apple cider vinegar, water and 4-5T of rub. I pulled it at ~200 and discovered for the first time that my weber thermo only reads up to 199* and then just flashes, when it's set for beef. I'll have to experiment with it a little more to see if another setting will allow it to go past the 199* mark. I then pulled it from the pan and wrapped it tightly in foil and put into a 250* pre-heated oven, then shut the oven off and left the brisket for 2 hours to cool slowly. I separated the point and flat then sliced the flat to see what it looked like. The flat was slightly dry (not as dry as the picture makes it look) and was pretty tender, but next time I'll start going by feel when I think it's done. There was a small smoke ring, but considering it was foiled after only a couple hours of smoke I'm surprised there was a ring at all. 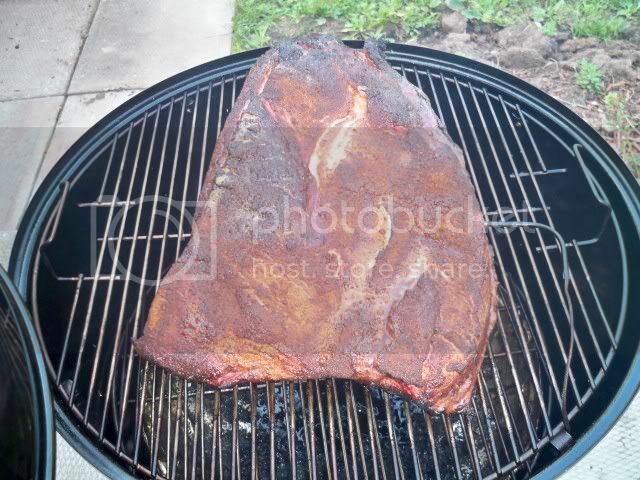 Next brisket will be done low and slow for comparison; I'm expecting a deeper smoke ring under those conditions. 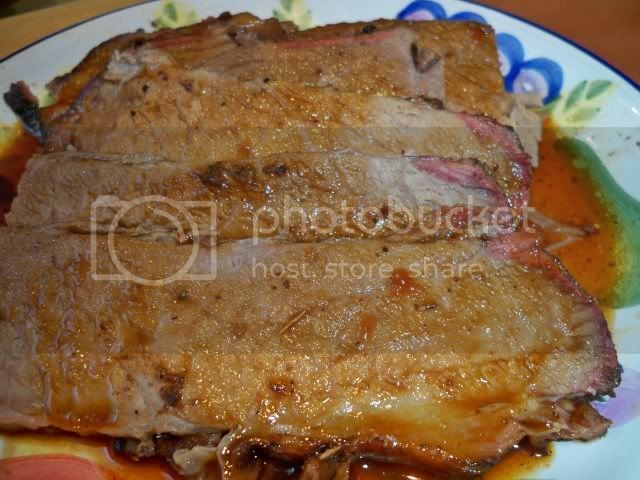 This brisket looks like it could have taken another hour or so, but I'm not disappointed with it at all. The sauce I made up was a real hit. I was going for a dry garlic sauce, because I love that with beef, so here's what I did. I pulled 1.5c liquid from bottom of the pan using a turkey baster and mixed in a glass bowl with 1/4c fancy molasses, 1/4c ketchup, 1T granulated garlic, 1tsp cayenne, 1 star anise (ground fresh), s&p to taste. The sauce turned out perfect without very much fine-tuning at all. I'll definitely make it again. Spooned over the warm brisket, man this was a real treat! I can't wait to try my next brisket, but I want to make sure I know what I'm doing first, so I'll do a little more reading and research before I try again. Thanks to all for your advice. 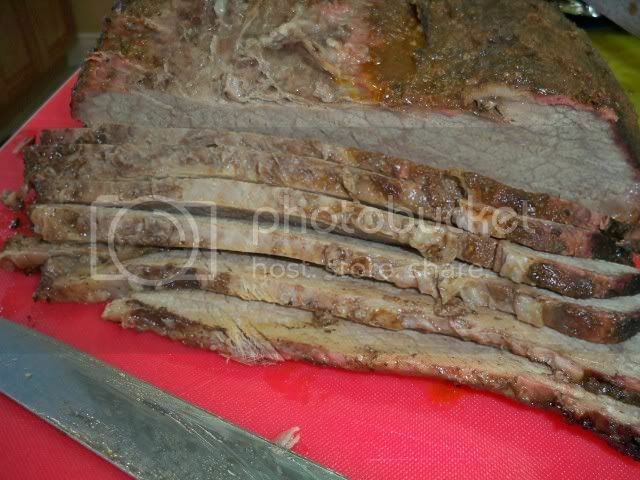 I am going to have to try a brisket soon as well. Question: Running a foiled pan at 300F; what were your vent settings? Mine will run at ~300F steady with all bottom vents closed, though I think I am getting air in between the bowl and mid-section. You know, Burt, I actually had some leakage around my charcoal bowl too, but I used some aluminum foil and it sealed it up pretty good.. I was running with what I though was all 3 vents wide open, but in fact turned out to be 2 vents wide open and one shut. Pretty strange set-up, I know, but that was just a brain fart as I usually balance my vents. Top vent always runs wide open unless I'm snuffing the fire. I'm still not really used to the larger sized wsm and I've only done 4-5 cooks on it, but I can already see it running cooler. I had to order a new charcoal bowl for this one, and I still have a slightly out-of-round center section, but I've pretty near got it right by now. I guess part of the fun is the fine-tuning. Sounds too much like work guys. I like the electrics. Plug it in, add the wood, fill the water basin, add the meat, set the temp. and have a beer. nahh... I get bored easy. Trev wrote: nahh... I get bored easy. Really, WSM are about as "set it and forget it" as anything out there.... even though they burn charcoal. Lotsa fire in an electric, it's just contained. Get bored? Have another beer mates. looks good. i still have not tryed one. doogster wrote: Sounds too much like work guys. I like the electrics. Plug it in, add the wood, fill the water basin, add the meat, set the temp. and have a beer. That is a good looking brisky, what kind of sauce did you serve it with? The sauce was made with 1.5c drippings (no fat), 1/4c molasses, 1/4c ketchup, 1T granulated garlic, 1t cayenne, 1 star anise, s&p to taste. I was going for a dry garlic type of sauce, like VH and this was pretty close. I love garlic with beef. That sauce sounds really good. I served mine with a KC sauce recipe by Paul Kirk. I will have to try this one next time.